Cursed songs, off-air romances and more fun facts for fans. Fans bid farewell to "American Idol" last night as the finale paid tribute to past winners and contestants during its 15-season run. To commemorate the iconic singing competition, here are some little-known facts about the series. 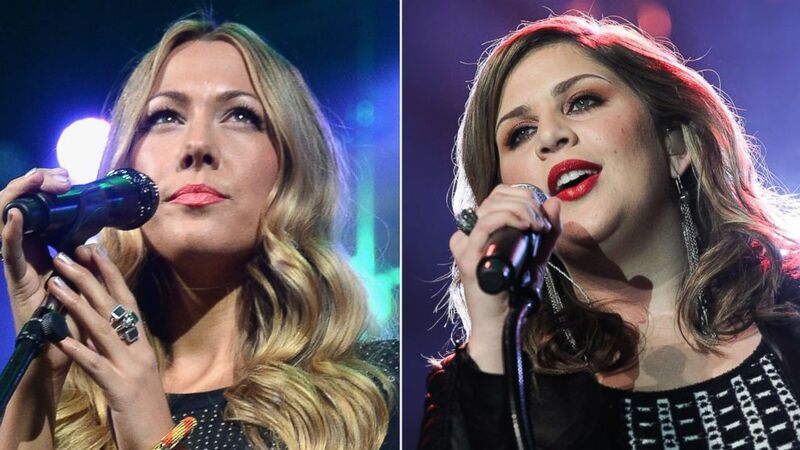 Surprisingly, singers Colbie Caillat and Lady Antebellum's Hillary Scott say they never made it past their "American Idol" auditions. "Tori Kelly did make it to Hollywood week and got cut, and she just got nominated for a 'Best New Artist' award," managing editor of Yahoo Music, Lyndsey Parker said of the singer. In fact, you didn’t have to take the whole competition to have an impact. Eliminated contestant Adam Lambert's hit song "Whataya Want From Me" appeared on Billboard's Hot 100, and Jennifer Hudson, who was also defeated, won an Oscar. (Getty Images) Left to right, Singer Colbie Caillat performs February 5, 2014 in New York City and Hillary Scott of Lady Antebellum performs February 25, 2015 in Nashville, Tennessee. "When people did the song "Feeling Good" by Nina Simone, they went home," Yahoo's Lyndsey Parker said. "There was one night where two contestants sang it on the same night and they went home." Those contestants were A.J. Tabaldo and Leslie Hunt of season 6, who both sang "Feeling Good." In season 11, contestant Hallie Day also sang a version of the ballad and was eliminated soon after. Other songs that sent people home, among others, were “I Wanna Dance With Somebody (Who Loves Me),” by Whitney Houston -- Jennifer Fuentes (season 2), Tiara Purefoy (season 3) and Asia’h Epperson (season 7) were all booted from the show, following their performances. Singers of “If I Ain’t Got You,” by Alicia Keys, Kinnik Sky (season 5), Syesha Mercado (season 7) and Taylor Vaifanua (season 8) were booted after their renditions of the hit song. In 2013, American Idol Season 10 winner Scotty McCreery tweeted some behind-the-scenes secrets from when he auditioned. "Fun Fact: For the Idol auditions you have to sing a song that is cleared by the show for rights and stuff," McCreery said in a series of tweets. "'Your Man' wasn't cleared my audition day. If you sang a song that wasn't cleared, they wouldn't put your audition on TV, which makes it tough on your chances of making the show. I told the producers I didn't care and I was singing 'Your Man.' Miraculously, about 15 mins before my audition, they told me they got it cleared!" He added that the producers burst out laughing and said they just wanted to hear it in a country voice. “If someone has the same song, then we draw out of a hat,” Hernandez told MTV News in 2008, adding that White won. Instead, Hernandez sang “I Saw Her Standing There” and the next day, he was eliminated from the competition. Dunkleman revealed the secret after his surprise appearance on last night's finale of "Idol," admitting that he lost contact with Seacrest since leaving the show in 2002. "I wanted to see him before rehearsal in his dressing room," Dunkleman told People magazine of his former co-host. "I walked in and he said, 'Hello' and we shook hands. I said, 'I have to get this out: I want to apologize to you for all the times we didn't get along back then.' I told him that I wished I could go back and change that but I can't. I wished him only the best for him and his family. It was a really great moment and he was so gracious." Dunkleman added that he holds no ill will towards Seacrest for continuing "Idol" without him. "The show does work better with one host," he said. "It's a tremendous amount of pressure and I didn't handle it very well. It's a testament to how great a job [Ryan] does to have done 14 seasons. It's incredibly gracious of him to include me tonight. It was a great gift." Although rumors circled of Clarkson and Guarini's relationship off the "American Idol" stage, the season 1 contestants never confirmed that they were actually dating in real life. Until, that is, over a decade after their 2002 appearances on the show. “We did date,” Clarkson said during a 2015 episode of “Watch What Happens Live!” adding that the pair didn't date during "Idol." During a 2014 performance in his one-man cabaret act, "Lovesick," Guarini revealed he and Clarkson were an item in the past. “I think any two people who were thrown together that much, I mean guy, girl, you put ‘Timeless,’ that song from ‘From Justin to Kelly,’ you can’t fight it!” Clarkson said. Clarkson is now married to Brandon Blackstock. The couple have a daughter named River Rose Blackstock and another baby on the way. ( Gregg DeGuire/WireImage) Justin Guarini & Kelly Clarkson during "American Idol" Season 1 Finale.